When you are looking to replace missing teeth, there are three main prosthetics that are often recommended by dentists: dentures, bridges and implants. These are tested-and-proven dental devices that can be used to restore a patient's smile and restore the lost function of missing teeth. Tired of living with missing teeth? Let us take a look at the benefits and disadvantages of these teeth replacement options. Knowing the differences between these prosthetics makes it easier for patients to decide which works best for them. These are arguably the most common dental prosthetic when it comes to replacing lost teeth. The low price tags compared to the alternatives are one reason, and some people also opt for dentures because getting them installed does not involve any invasive treatments or surgeries. When a patient decides on dentures, the dentist takes an impression of the person's mouth. These dimensions are then sent to a lab where customized dentures are made for that particular person. Dentures can be easily inserted and removed. Patients dealing with an unsightly gap in their teeth can have it taken care of with a bridge. This device consists of fake teeth that serve as a bridge between the two teeth closest to the gap on both sides. The bridge restores the function of the missing teeth, allowing the wearer to chew foods and speak just like they did before losing any teeth. Implants serve as a replacement for natural teeth and their roots. These are the preferred option when it is time to replace missing teeth. During the installation, a metal rod is inserted into the patient's jaw, and a crown is placed on it once fully fused with the surrounding bone tissue. Contact one of our dentists to learn more about teeth replacement options. 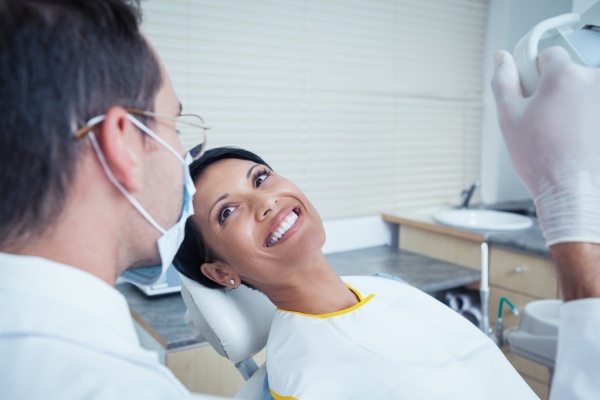 Request a dental appointment here: http://www.simplysmilesdentist.com or call Simply Smiles Dentistry at (520) 368-3351 for an appointment in our Tucson dental office.